Imagine this: it’s 1900 and you live in Hollywood. You are one of a population of a few hundred. In the village, you can shop in two markets. Other amenities in your surroundings: a local post office and a hotel that hasn’t been built yet. The closest to civilization is Los Angeles, separated by seven miles of loose road connection and vast fields of orange groves. 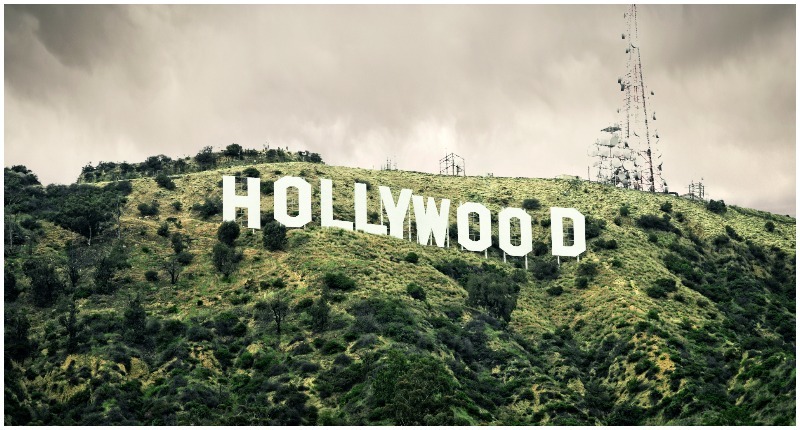 However, it took Hollywood less than two decades to spur a thriving city life and become the hot seat of the fast-growing film industry. Glen-Holly Hotel, the first hotel in Hollywood, at the corner of what is now called Yucca Street. It was built in the 1890s. Two factors were key: the interest of the industry to migrate west, and sufficient infrastructure in an area that faced issues such as proper access to water. Slowly the jigsaw was being fitted together. The first section of the Hollywood Hotel, an elegant wooden palace surrounded by lemon gardens, opened its doors at the end of 1902. Two years later transportation in the area improved too with the building of Prospect Avenue, which later became Hollywood Boulevard. One by one, filmmakers, attracted by lower taxes, began abandoning the East coast and settling in the village. Labor was also more affordable and combined with the scenic beauty of the region it seemed not much was missing. Bonus point for all that California sunshine. 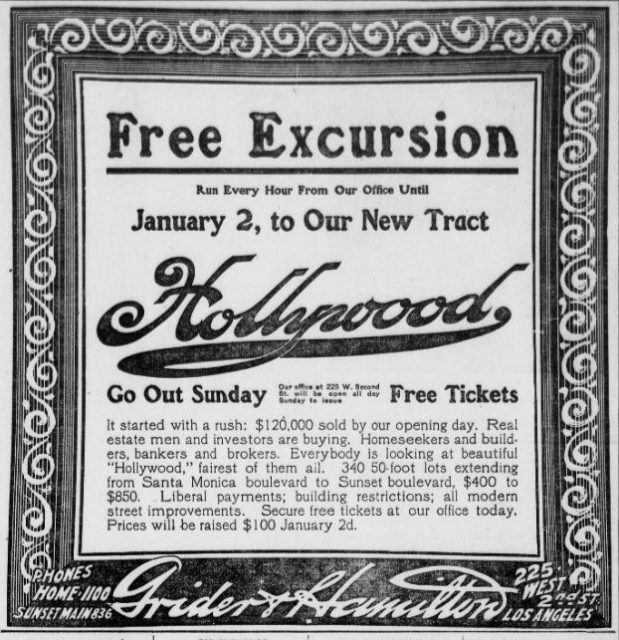 Newspaper advertisement for Hollywood land sales, 1908. 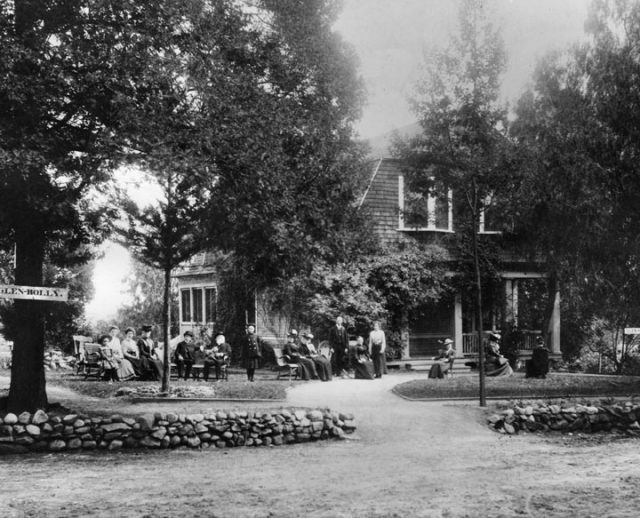 In 1910, D.W. Griffith used Hollywood village as the setting for his movie In Old California. The very first piece filmed in future Tinseltown. 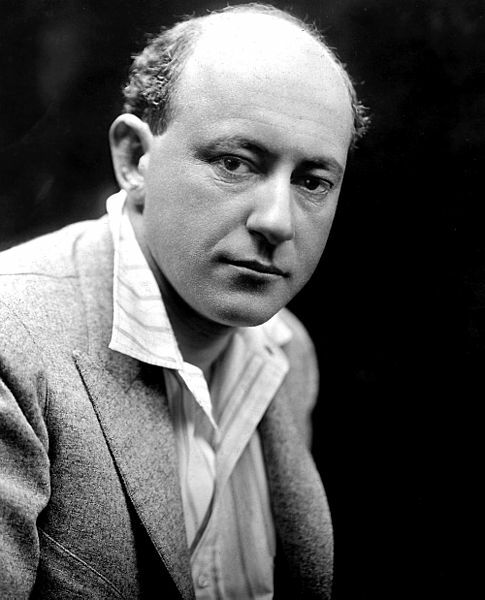 Four years later, Cecil B. DeMille debuted as a director after filming the Squaw Man, also there. Sooner rather than later, Hollywood was the thriving, vibrant new center of American cinematography. It was the dream city of aspiring young artists, who, lured by fortune and fame, relocated in the city and sought jobs in acting. At the same pace, small independent filming studios mushroomed, initially struggling to even survive year one. As the film industry evolved, so these little entities became the giants that would dictate their own next steps. 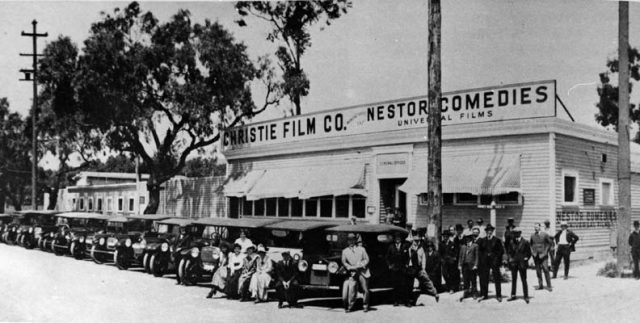 Nestor Studio, Hollywood’s first movie studio, 1912. If there was but one central issue that threatened the future of Tinseltown it was water shortage. 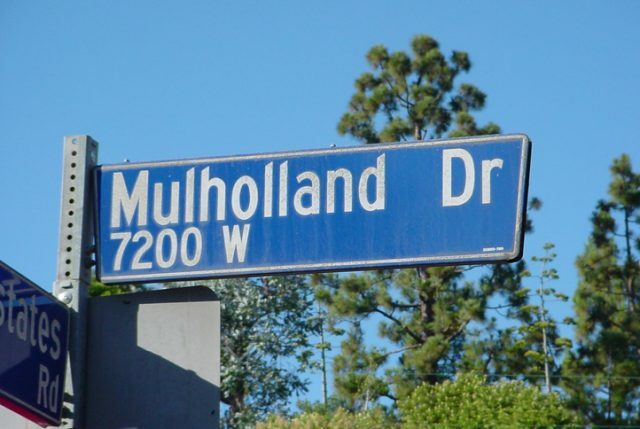 Due to this ongoing issue, local residents opted for Hollywood to be administered by the City of Los Angeles. 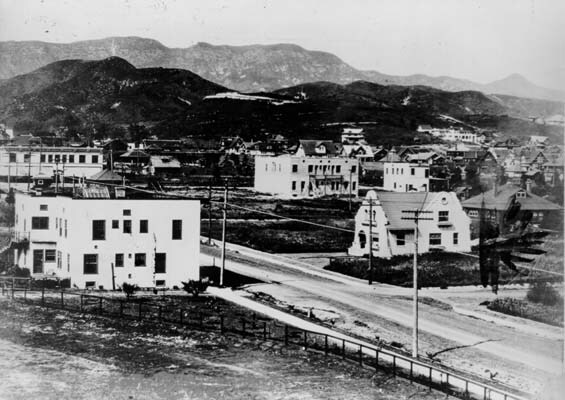 By striking contrast, Los Angeles homed a population of over 100,000 at the turn of the century. The city was about to commence building a new aqueduct system. But the Owens Valley Aqueduct, as the project became known, was not going to pass without calamities. The fertile Owens Valley was controlled by the U.S. Reclamation Service and was originally planned to provide water to local farmers living in the area of the valley. 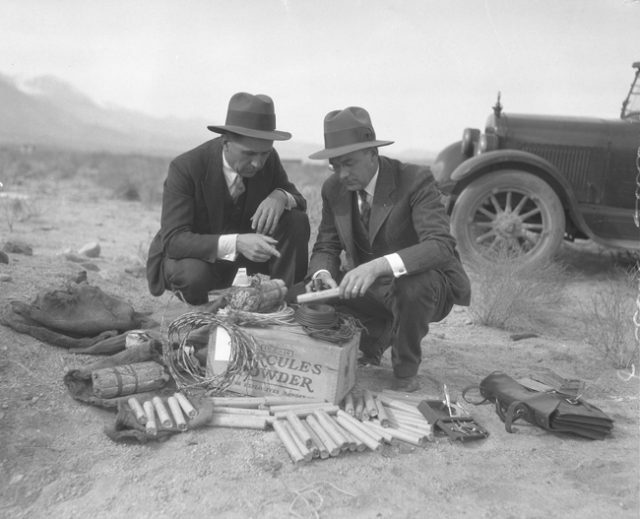 Two men examining a kit of dynamite and wire found during sabotage incidents of Owens Valley Aqueduct, Southern California, c. 1924. An attempt to build an irrigation system for them was blocked by William Mulholland, the chief engineer whose single job was to secure water for the greater Los Angeles area. Mulholland used deceitful tactics to win the dispute that arose with the farmers. The case was brought to Washington D.C., but the decision ultimately ruled in favor of L.A. The aqueduct construction was a gigantic construction project. The long miles required a workforce of thousands and the effort lasted from 1907 until 1913. The conflict between Mulholland and the group of angry farmers persisted for a little longer than that. A climax point came in 1924 when the opposition tried to sabotage the water system with explosives and reroute the water to the Owens River. They didn’t achieve success in the long run, however. By the mid-1920s most of the available water was in the ownership of the City of Los Angeles and nothing, not even dynamite, could now threaten the city’s glorious rise. 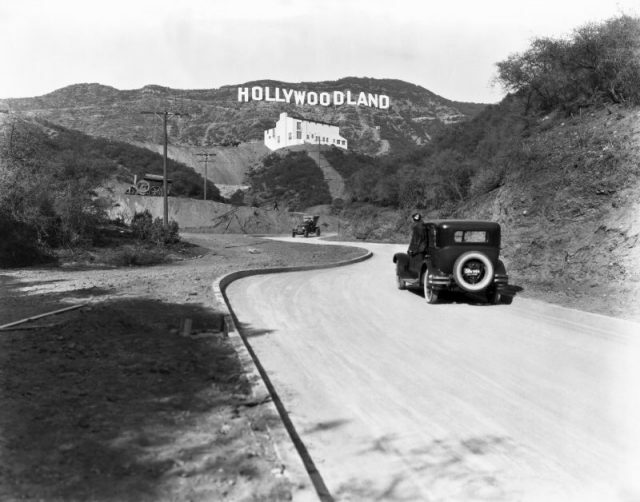 Dotted with fanciful hotels and bars that imitated exorbitant movie sets, by the 1920s, Hollywood was all set to live long and prosper. Its vast boulevards became adorned with high palm trees. Glamorous neighborhoods started sprouting up too, now the home of a new elite that could hardly ever see a dent in their wallet. Each week, their machinery hurried 40 million fellow Americans to check what’s new in theaters. A brave new tinsel-world.